Why you should not travel alone? The world is nothing but an impression left by telling a story. It was periwinkle sky that day. The longest dawn I have ever seen. I am the guy who has always loved sunsets more than sunrises and believed in dusk more than dawn. But on that day I waited for sunrise more than anything else. I feel sunsets give an ending to the million stories started at sunrise. It shows us the horizon beyond which a new world starts or where our world ends. After spending most of my year in traveling, watching sunsets in different cities, on different beaches and in different valleys, the stories, more or a less, ended up with the same climax. Heroes from my stories saw their morning, lived their noon, fought with their evenings, gave up in the dusk and returned home in the night. Many of them didn’t turn up until the next day. I loved watching them, how easily they gave up on something for which they fought their whole day(life). I loved them, just because I was one of them. I wasn’t there in every story I saw. I was a witness, sitting on a beach, watching waves dying silently as they reached the shore. But many of my heroes never reached the shore. The first story of the year, where my hero left home to be a wanderer, returned back to where he started.. People around him wondered why he left home in a first place if he had to come back, why wasted his years from the life which could have spent in building a career. People started bringing back the issues which didn’t have any significance for him anymore. Most of the variables from his life got settled while on the road. The issues over which people fought, didn’t even exist where he spent his summers. The issues over which people delayed living their life, didn’t even exist where he spent his winters. The issues which had the main place in his own house didn’t even exist beyond the horizons from where he came back. He gave up on the people around him, just to return back in the wilderness, not for his wanderlust but to escape the world which was no more synced with his life. For him, the reality did not exist as long as he was looking in some other direction. My second hero, he was not much different from the first. But he did not give up on people around him. He gave up on himself. He gave up on the ideas he collected while he walked down the lanes of some old city in starlit nights. The starlit nights, where the universe shows us how tiny we are in this dream we call life. He felt those ideas exist only when the night is bright and full of stars. After the evening he gave up, the night which followed was indeed dark. People of his country never believed that the stars existed. Though he had seen stars in other parts of the world, he couldn’t convince them. He denied being a fool which speaks the truth but accepted to become a man full of lies. Even I doubted my ideas I pictured on the canvas of those dark nights. No one saw the death of light and everyone believed in the darkness that followed. I saw many of them. Talked with a few of them. They sat on the same beach with me. Some closer to the shore, some far away in a shack. They watched the same waves, same sky, same ships and same stars. But each of them had a different story, some of them took a few more sunsets before closing down on the things. Each of them had different places to go. Some got on the same bus on which I traveled, some got off early, some got off with me, and some went ahead. I never knew which story I belonged to. I have been part of many of those stories. I was at the start in a few, in middle of few other and in the climax of a few remaining ones. I was the one who gave up on people one fine evening, I was the one who gave up on myself the other evening. But also I was the one who stood up there to see the sunrise. 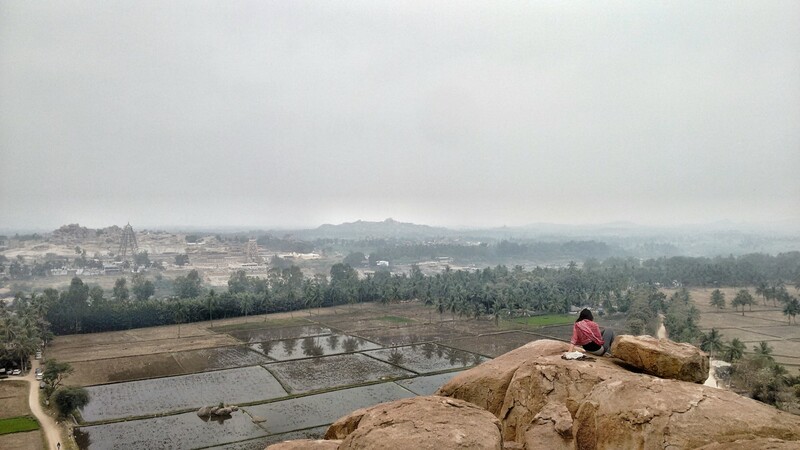 The sky was crowded with gray clouds spread over the fields full of boulders and ruins. Eyes gazed, relentlessly, at the horizons which kept going farther and farther with every breathes. I doubted that sun would rise behind the clouds and again I would have to wait for sunset to see a new story closing down. I never knew that standing in the same place, I had watched different horizons, while others couldn’t go beyond a few kilometers. I never could tell them the stories that existed before my own eyes were real. I never could tell them that I have changed my gods and those did not exist in the temples they took me to. I wish I could tell them. If only they would have come along with me this far. I would have shown them where the river you worshiped ended up in a big ocean. But I traveled alone. I couldn’t wait for them because I did not find my heroes in their stories. I don’t know which story you belong to. But if you can’t go back home with the new stories, don’t travel alone. If the truth makes you uncomfortable and you are happy with your tales of deceit, don’t travel alone. I saw the sun rising that day. I saw a new story beginning that day. I knew I have to come back home, with a story, where my hero has to wake up for every sunrise to come. Where the sun sets just to come back again. I knew that mine would be a story, where my hero did not give up because this world is nothing but an impression left by telling a story.